Find how Sanitary Sensors works on this link. This Pt100 RTD sensor is designed for use in sanitary or Clean-In-Place (CIP) applications where the use of a thermowell assembly is preferred over direct immersion sensors. The thermowell includes a 1½", 16AMP cap feature for easy installation using industry standard gaskets and clamps. The spring loaded RTD probe can be removed from the thermowell without exposing the system to ambient conditions for calibration or replacement. 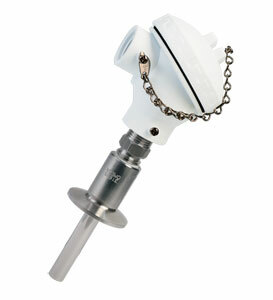 This sensor is also supplied with a white polypropylene screw-cap style connection head with 3/4"NPT conduit connection standard, Stainless steel screw-cap heads, and a flip top style white polypropylene head are also available. Optional stainless steel connection heads available. These sensors are supplied standard as 4-wire assemblies with two red wires and two white wires. When used in 3-wire applications, cut off one white wire making sure that it will not contact any terminals or metal surfaces (note: twisting the two white wires together will reduce the lead wire resistance on one side of the sensing element by half adversely affecting the accuracy of the reading). When used in 2-wire applications, cut off one white wire and one red wire (note: in 2-wire applications, twisting the two same-colored wires together at the terminals will not adversely affect your sensor accuracy since both wires will be affected by the reduction in resistance). Note: Please contact sales for other clamp sizes and styles, for other lengths, or for thermistor or thermocouple versions of this product. High Accuracy RTD Pt100 Input Thermometers. USB or Wireless Interface Options.